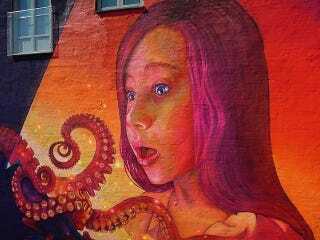 This is a close up of a mural artist Natalia Rek did for the Art Scape Festival in Malmo, Sweden. It's called "Magic Book," which is perfect. Rek's other 2014 work is similar in tone, but themed around science exploration. It's called "Explore Nature," and it and the full-size "Magic Book" are below.